SCOTUSblog has become almost as recognized an institution as the institution it covers. The blog is highly respected and widely followed for its detailed and insightful coverage of the Supreme Court. A big share of the credit for that goes to veteran Supreme Court reporter Lyle Denniston, who announced in a post Saturday that he is leaving SCOTUSblog after a dozen years there. So much of the rhythm of my life, and that of my family, has been dictated for more than a half-century by the Supreme Court’s calendar. And so it is with the completion this coming week of the Court’s most recent Term. With one more live blog, and some picking up of loose ends, my journey with SCOTUSblog ends. It has been a fabulous trip, since February 2004, when my then-latest attempt at retirement proved — as usual — to be premature. In those twelve-plus years, SCOTUSblog has become a standout in legal journalism, more than fulfilling the creative dream that Tom Goldstein and Amy Howe had when they started it before I logged on with them. SCOTUSblog is very much a group effort, spearheaded by the husband-and-wife team of Tom Goldstein and Amy Howe, who founded it in 2002. Some 20 people work on or write for the blog and a greater number have contributed over the blog’s 14 years. Given that Denniston has covered the Supreme Court since 1958, one of the great ironies of his tenure at SCOTUSblog was that the blog could never get press credentials, although Denniston was able individually to get credentialed. 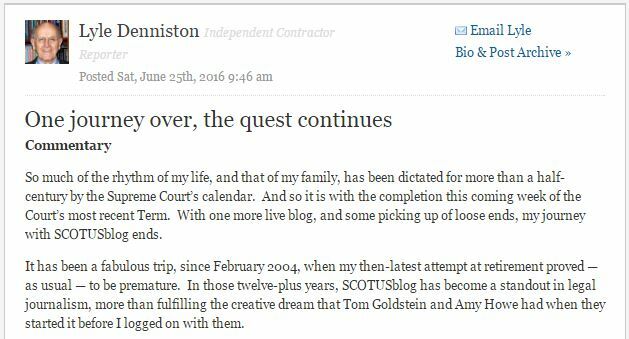 In fact, Denniston says this was his biggest regret from his years at SCOTUSblog. The blog has also taught me that serious journalism still has a very large place amid the babbling noises of the Internet. I have but one regret, and it is that I was unable to persuade the traditional journalists who control the credentialing for Congress that I was as independent as they feel they are, and that journalism can take unusual new forms and still be journalism. Even as he leaves SCOTUSblog, the 85-year-old says he is not retiring. In his post, he says that he will be expanding his role in covering the court for Constitution Daily, the blog of the National Constitution Center in Philadelphia, to which he has contributed since 2011. We wish him all the best as he moves to the next stage of his quest.